Hey hey! It’s time for another “Shop & Tell” entry and today I'm happy to share this lovely feature of the every talented Charlene Andersen of HandmadeRetroTopShop with you! I first came across Charlene’s work on eBay and couldn’t resist the allure of her retro-style tops. At first I wasn’t sure about sizing so I shot Charlene a note and was pleasantly surprised with her detailed response so I made the jump and got one and let me tell you, it did not disappoint. Today I’m happy to share this chat with Charlene so you can learn more about her shop. A couple years before opening my Etsy and eBay shops, I had a strong, creative feeling inside...a feeling that something was waiting for me to discover inside myself and express. (I’d always been creative as a child and excelled in the arts. I majored in Studio Art in college and worked in Industrial Design after graduation.) Once my kids were old enough, I started hand sewing, especially deconstructing and reconstructing clothing. I didn’t even buy a sewing machine until August 2015. Once I finally took the plunge and bought a machine, I learned everything I could and hit the ground running! This is exactly what was waiting for me to discover and to immerse myself in. I started making simple, feminine, retro-styled clothing (based heavily on sewing patterns, but making some twists - like making it reversible, changing hem lines, etc). I created what I wanted for my own closet and realized that at the rate I was creating, I couldn’t possibly keep it ALL for myself. So, I started listing a top or two on eBay to see what happened. Within days they sold out and since I got such great feedback from them, I decided it was an option for me to get rid of any “excess” creations. 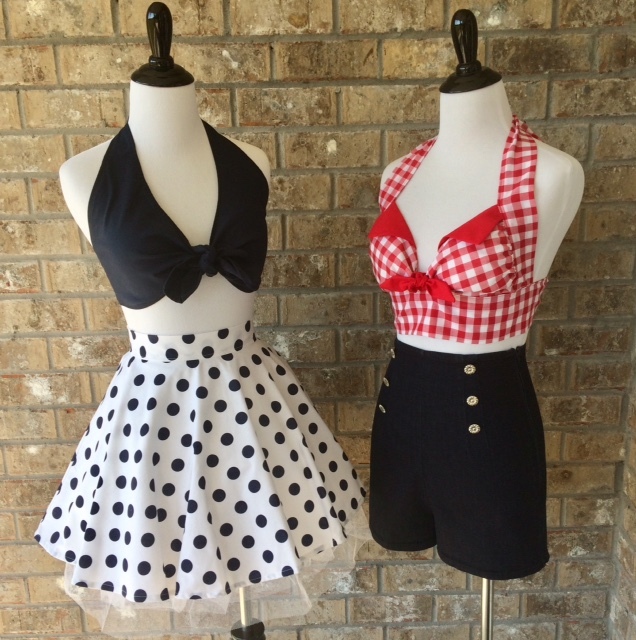 Quickly it unfolded into this swell of retro-inspired clothing design and “HandmadeRetroTopShop” (featuring halter tops, but also skirts, shorts, jackets, hats, purses, dresses and blouses are available at times) was born! I adore your handmade tops, how they’re retro-style, reversible & colorful. What inspires your creative work and how’d you learn to sew? Above all else, my husband, Joe, inspires me and my creative process. I met him back in 1995 when he was an upright bass player in a Rockabilly band. I fell in love with him at first sight. As well, I fell in love with the whole retro/vintage/rockabilly world. I began dressing in this style, not knowing that years later I’d be dressing exclusively in my own creations. My mom taught me how to mend, but not to sew. I taught myself how to hand sew garments and I learned a lot from deconstructing and reconstructing. Everything became possible especially when I switched from hand-sewing to machine-sewing, as you can imagine! I actually discovered you on eBay and later found out you also sell on Etsy. What’s your reason for using both platforms, do you have a preference of one over the other? If so, can you share why you have a preference? I already had an eBay store for selling odds and ends of things we didn’t need, so it was easy for me to create new listings for my handmade tops. I heard about Etsy as an artsy place online for people to sell their handmade items. It didn’t take me long to build up the confidence to create a new Etsy store “HandmadeRetroTopShop” and just get a feel for whether my creations were even desired by anyone (other than me). So, toward the end of 2015, I started a group of handmade retro reversible top listings. It wasn’t long and each sold out just in time for more to be made in different patterns and colors. I couldn’t stop the creative juices flowing like crazy! So many possibilities! So many designs to try!! Although I keep two eBay stores (TimelessRetro & VintageDaisy8) for a wide audience, I do prefer Etsy (HandmadeRetroTopShop). I just feel the artsy presence there and it feels good to be selling amongst amazing designers and crafters of all sorts. Etsy is easier to maintain too with easy-to-reactivate and edit listings, an archive for all my old listings and overall lower fees. Who/what are some of your retro inspirations? Joe, my husband, is my biggest inspiration (he has helped me in almost every creative turn and trial run I’ve taken with my designs). He introduced me to the whole world of retro, vintage and rockabilly. Our dating years were full of Rockabilly shows (including his band opening for Ronny Dawson, High Noon and Wayne Hancock to name a few), tattoo festivals, art shows (he was a fine art watercolor artist) and art museums. Old Hollywood movies, and all the 1940s and 1950s photographs are a heavy inspiration. Ava Gardner is my favorite. She embodies simple, sweet, natural beauty that I want to emulate in my designs. So much so that I named my best-selling halter top style after her. You probably wear many hats in your business, what are those hats and what keeps you motivated? Many and all hats! I am the sole designer, creator, promoter, material buyer, marketer, customer communicator, shipper, social media coordinator, and maintainer of all my eBay and Etsy listings. I don’t have to try to stay motivated. It happens so naturally. I am constantly seeing new fabrics or retro styles that I want to make for myself and when something is a winner, I create another to share the joy (to sell). Positive customer feedback is always a strong motivator. I love it when someone shares the happiness my clothes bring! I didn’t set out to make money or have a business. It developed from the love inside to create. I had to design to fulfill my soul. I had to create and learn and share it. If you do something you love, you can easily succeed. The possibilities are endless. Surround yourself with inspiration, environment and positive people. Keep things as simple and streamlined as possible, and keep a healthy balance of work and life. I have a Twitter (@HandmadeRetro88), an Instagram (@HandmadeRetroTopShop) and Pinterest (HandmadeRetroTopShop). I don’t use Twitter as much as IG and Pinterest for my handmade items. My Twitter I used for my inspiration (automobiles, vintage photos, and some of my handmade items). I’ve found that since my products are easily seen as a spread of work, both IG and Pinterest (“My Handmade Retro Clothes” board) can serve as a glance at all I’ve created. I’m most active these days on Instagram and have picked up many customers from it. To be honest, I never look to increase my selling. I can barely keep up with the demand, and I sell out of items almost every day. As an artist, I like to have a portfolio of past and present creations. I couldn’t be more pleased with customers’ responses to my items. 8) Last but not least, can you share something about yourself/ your business that's not on your about page? A huge thank you to Charlene for sharing her story and insights with us. Stay up to date with her latest designs by following her on Instagram and be sure to stop by her Etsy shop to snag beautiful vintage-inspired clothing with my 10%off coupon THANKS10.